An unlikely prince, he looks. But this prince of the church charmed the Sun King. He is the man who told it to the Roundheads straight; who, aghast, watched his friend die on the scaffold, and who ended up bishop-prince of a castle as invincible as any on this strange collection of islands. I met George Morley today, through the castle he changed forever, the fortress in which in his life ended peacefully on an October day in 1684. Morley was born in Cheapside in 1598, a newborn Elizabethan, but he was an orphan by the age of 13. Nevertheless he went to Oxford and excelled there, becoming a man of the church. A staunch royalist, he was outspoken as the days of Charles I drew to a close. Parliament did not like what he had to say when he preached at them in 1642. He was continually skirmishing with the Parliamentarians and was even imprisoned for a short time. And then his friend, Arthur Lord Capel, was arrested for royalist plotting. 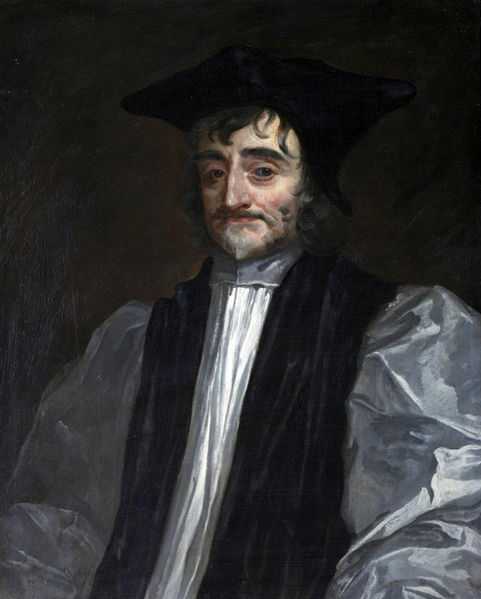 Morley went with him to the foot of the scaffold: and when he had stood there at his execution, the priest took all he had in the world – some £130 – and headed for the exiled court of King Charles II at Saint Germain. He shared elevated company during his exile. Louis IV became a friend. A spell later, with Restoration in the air, Morely became one of the chief negotiators between the court of Charles II and the Presbyterians back home. And once Restoration was achieved, he had a finger in every pie. Eventually, he became Bishop of Winchester, and came to live at Farnham Castle. An ancient stronghold built at the behest of William the Conqueror, it still takes the breath away today. Perched on a hill with great swathes of Surrey at its feet, every monarch of note had been part of its history, for it lies on the main artery between London and Winchester. Just a short while before our strange hero acquired the bishopric, a wing had been built onto the stolid Norman house which abutted the motte and bailey mound, especially to accommodate the court of Elizabeth I. It had escaped Henry VIII’s dissolution, and sacking after the Civil War, unlike other bishops’ castles which were razed to the ground; it seemed this castle was untouchable. As you walk round today, Morely’s touch is still everywhere. In airy extensions, a grand staircase fashioned by Grinling Gibbons; in the raising of the roof of the great hall to provide light, air and a balcony. In a stunning chapel designed to bring the priest into the very centre of the congregation. At every turn there is a moment of revelation. An ‘ooooh!’ moment. Like the very best old houses, Farnham Castle has myriad nooks and crannies to explore, and constant surprises: a secret staircase from the back door, which leads to a bookcase in the Bishop’s private room; a suite of Elizabethan guest rooms, each designed to hold ten people each; graffiti from 1849 etched into a leaded window; 900 year old wooden beams which still stand the castle tall today. And a chapel door sent to Morley by Louis IV himself: carved with exquisite suns, to remind the austere bishop of the Sun King. To walk around it is to be in love: the grace and beauty, the unexpected perspectives from galleries which take one up high, the tall red brick tower. Morely and his fellow princes have built a place of uncommon grace and beauty. Yet at the heart on the building, underneath a staircase, is a tiny cell. And this is where Morely slept; getting up at dawn without a fire to warm him, living a monastic life at the heart of all this affluence. Hearsay has it that he had a coffin made for himself towards the end of his life and chose to sleep in it, in that tiny space, remembering that he was dust, and unto dust he would return. At the heart of the affluent, a monkish austerity. The whole, untouchable castle is a princely paradox. Posted in Places to visitTagged Bishopric of Winchester, Bishops, Farnham Castle, George Morley, historyBookmark the permalink. Beautiful castle, thanks for the tour. Pleasure, Steven. I wish you could have walked round. It is a stunning place. Drat. Another wonderful castle which was within reach that we haven’t reached. A list of castles and stately homes etc you have visited would be quite fascinating to see. I must work on that, Col. You know this part of the country: it’s peppered with them. It was quiet that day, Roger, but I suspect this castle has until now had a colourful life, right up until the present day. In the second world war it was a ‘Camouflage Development and Training Centre’ (Thinks: Monty Python, ‘How not to be seen’) and snce then has revelled under the enigmatic title ‘International Briefing and Conference Centre.’ It is humming, much of the time. Now the Galloping Gourmet company has moved to take it over as a corporate and wedding venue. I have to admit that the gloomy portraits of the boshops have been taken down from the great hall because brides might think them too sombre. So: the future of this beautiful place is an open book. He looks so ill; but, the castle is lovely and the post is interesting. Always open to a bit of new-to-me history. I find old castles fascinating, and this one, it seems, is one I must put on my list to see. Great story. Wonderful photos made me feel like I was there. And the fact that he slept in a coffin, well…. It is a nicely gothic touch, isn’t it, Jennifer? ‘H’ was very touched by this interesting post. George Morley was an important benefactor of his old school founded in 1351 (which sadly no longer exists) – Farnham Grammar – and in fact H was in Morley House. Each morning at assembly the Headmaster said a prayer recalling the names of the founding fathers and benefactors including Morley. It is engrained on H’s mind; he knew George Morley was Bishop of Winchester but was unaware of the rest of his history. Fascinating and thank you. Rosemary, I am so pleased it added to H’s knowledge about Morely. I found researching him an absorbing business. By all accounts he was a charming young man, but always with tis stern and slightly inflexible side. The Oxford National Dictionary of Biography has a fantastic entry on him – I highly recommend it. I passed the castle yesterday, approaching it from the Frensham side. It was late afternoon, and the mist had started to descend again. The castle was just visible on top of the hill. It’s completely hidden from this side, private and mysterious. You took some lovely photographs. We are only 5 miles away. Such a beautiful area, Myfanwy. Maybe a picnic in the Summer? By the way, was talking about Columbiere yesterday, she is now in hospital and very weak. Just thought I’m mention. If I hear any more I’ll let you know. I knew exactly who you meant! Thanks, Myfanwy. Never heard of him Kate – just fascinating. Perish the thought – did he know Gazza by any chance? 😀 Why, does he sleep in coffins too? No they share the same taste in furnishings! Off to Barcelona for the weekend snow permitting – Ole (or the Catalun equivalent)! Cheers Kate – have a good weekend – look out for Bob On The Pot tomorrow – its a different one! What a very interesting castle, but fascinating man! What an uncommon man to be drawn to the monastic life when also inspired to continue to build and create beauty and expansion for the purpose, perhaps, of creative expression? I’ve never heard of Morely, but he is indeed intriguing to me. Your photos are just great. The Sun King’s contribution is just beautiful. I saw the door and just gasped, Debra. The house is full of incredible beauty but that must have been the most dramatic moment of the whole tour. I feel like I would want to have tea with Bishop Morley. He does look very sad and/or ill in his portrait, it makes me sad. Farnham Castle is lovely, it’s a shame he didn’t really ever let himself appreciate it. I can identify with his need to shed all the material stuff as he grew closer to death, Weebles. I would love to see what you came up with standing next to his little cell. Me too! I can’t wait for my next trip to England, so many places to visit, so many vibes to get. Is this NT or English Heritage? Surprised I haven’t been..yet!! Wonderfull writing as usual, making the words dance!!! Read this one this morning on my phone, back now to comment, because the whole story is so marvelous, and then the truth about his little sleeping cell amidst the splendor just undid me. It’s been haunting the back of my thoughts all day. Your photos are wonderful, Kate. I appreciate the glimpse into Farnham Castle, as close as I’ll likely ever get. What an interesting man Moreley was. The sleeping in his casket sounds so familiar – and so eerie. Wow! Reaching the age of 86 in treacherous times is quite the feat. Thanks, Kate. Many of the details in the architecture of that castle are so beautiful. I was thinking the same thing as nrhatch. I suppose there is something to the monastic life that contributed to Morely’s longevity in that era, or maybe he just had phenomenal genes. An interesting post Kate. Morley’s portrait is indeed not very flattering! I look forward to visiting Farnham Castle. In Charles I reign about a dozen people were executed for capitol crimes. The “Christian ” Cromwell caused the death of so many thousands. Given the view, I would have shunned the cell. Unlike Morely, I would have avoided the casket until my inevitable conclusion.